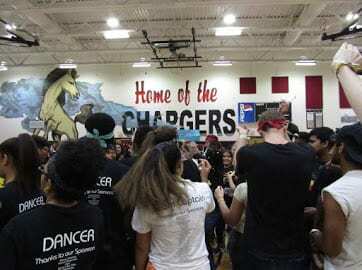 Students at Strawberry Crest High School will lace up their dancing shoes and participate in the annual Chargerthon to raise money for the Children’s Miracle Network. For years, students at Strawberry Crest High School have boogied all night to raise thousands of dollars for the Children’s Miracle Network. The annual Chargerthon event combines a dance marathon with social activism as students seek support from the community to sponsor their dedication to physically stand for hours on end and raise awareness and support for John Hopkins All Children’s Hospital in St. Petersburg. Courtesy of JP Prescott. There is dancing, games and planned team routines throughout the event. In the last few years the group has been able to raise more than $60,000 and this year they’ve set the goal at $25,000. It’s a lofty mark, but one the team is determined to meet. When the dance marathon comes to an end and the final number raised is officially announced the students go home knowing they pulled off “miracles” for children throughout their community. The event is entirely student run and operated with a teacher, Dianne Schroeder, as an advisor. There are 20 students on three different boards that work tirelessly to pull off the massive event. The event is comprised of a variety of teams full of 10 to 15 students that all pick a theme under the overarching topic to represent at the event. This year the theme for the event is movies and more than 30 teams with names like “The Breakfast Club” “Star Wars” and “Mean Girls” are competing to raise the most money for the cause. Courtesy of JP Prescott. Chargerthon raises thousands of dollars for John Hopkins All Children’s Hospital in St. Petersburg. There is also a scavenger hunt that takes students through a variety of games and sends them on the hunt for unique locations as well as a lip sync/performance battle where teams can show off their movie themed routines. Students that participate are all fighting for the opportunity to say they raised the most for the reputable cause. One incentive to keep the enthusiasm going year round is a created category called “spirit points.” Every dollar raised over the $250 individual goal is one spirit point. Those points are added up and winners will receive specialized baskets full of prizes. The week prior to the dance marathon is a spirit week that helps boost awareness and get everyone pumped and ready for the big night. Chargerthon is also helping students develop skills they’ll rely on for years to come. Meghana Yarlagadda, a junior who is a member of the finance board, spends her days talking to local businesses while sharing all the reasons they should sponsor the program. The finance board manages the incoming funds and at the end of the event are able to watch with a smile as the hospital walks away with thousands of dollars to help its patients. This year the students have an even deeper motivation for raising as much as they can for the cause. One of the school’s IB teacher’s has a daughter seeking treatment at John Hopkins. They’re fighting for her as much as they are for every child that walks through its doors. The dance marathon is Feb. 23 and the group will be accepting donations through the end of the event. You can follow the progress of the group on any of its social media sites via the @chargerthon handle.